It appears Panasonic will be first to market with their 64 gigabyte SDXC card, announcing that it, along with a 48 GB model, will be available in February 2010. The new flash cards will beat Toshiba's own 64 GB SDXC cards, which were announced in august with a release date of "Spring 2010." Of course, at $600 and $450, respectively, only a select few will be able to take advantage of their increased capacities and improved read/write speeds of 22 MB/s. The 64 gig card is capable of holding 8.5 hours of 1080p home video. 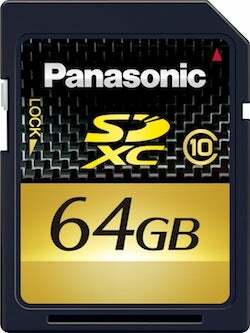 LAS VEGAS, Jan. 6 /PRNewswire-FirstCall/ — Panasonic today announced the availability of the company's first 64 GB* and 48 GB* SDXC Memory Cards. The new SDXC Memory Cards, the RP-SDW64GE1K (64 GB) and RP-SDW48GE1K (48 GB) are Panasonic's largest-sized GOLD cards with Class 10 speed specification. Featuring new advanced Super Intelligent Controller helps to improve the reliability of the card and extend its lifetime. The new 64 GB and 48 GB SDXC Memory Cards will be globally introduced in February 2010 with suggested retail prices of $599.95 and $449.95, respectively. SDXC is the next generation SD Memory Card, a new standard for storing data more than 32 GB and up to 2 terabytes. The Panasonic 64 GB SDXC Memory Card features a massive 64 GB of capacity, making it ideal for recording AVCHD High Definition video, high-resolution, or even RAW still photos. When used with Panasonic's newly-released camcorders, such as the Panasonic HDC-TM55, the 64 GB SDXC Memory Card can record up to 8 hours and 30 minutes of video, while recording in the highest video quality in HA mode. Or when recording in 1920 x 1080i in HE mode, the SDXC Memory Card can hold approximately 27 hours and 30 minutes of video. The 48 GB SDXC Memory Card will have nearly the same capacity as a dual-layer Blu-ray Disc, and can hold 6 hours and 20 minutes of HD video content recorded in HA mode and 20 hours and 20 minutes when recorded in HE mode. With the Class 10 speed specification and maximum data transfer speed of up to 22MB/s, the new Panasonic SDXC Memory Cards allows users to enjoy superb performance when using with an HD camcorder or a digital interchangeable lens camera, such as the Panasonic LUMIX DMC-GF1, for high-speed burst shooting when taking still photos. The 64 GB and 48 GB SDXC Memory Cards, along with other Panasonic GOLD line Memory Cards, provide longer lifetime, thanks to the adoption of Panasonic's newly-developed Super Intelligent Controller, which evolves the current Super Intelligent Controller used in the Silver line Memory Cards. With the new Super Intelligent Controller, flash memories are automatically refreshed with error corrections, thus preventing data damages and providing longer lifetime. The new SDXC Memory Cards include a new technology designed to minimize accidental corruption caused by a power interruption, such as the Memory Card being removed while data is being transferred. Panasonic's SDXC Memory Card robustness is reliable even under severe temperature condition from -13°F to 185°F**. For more information, please visit www.panasonic.com/CES2010. *1 GB = 1,073,741,824 bytes. Usable capacity will be less. SDXC Memory Cards can only be used in SDXC host devices, which support the SDXC Memory Card.